RF solid state power amplifier (SSPA) PE15A4008 from Pasternack is part of the largest selection of in-stock radio frequency microwave and millimeter wave amplifiers available for same-day shipment. This Pasternack solid state RF power amplifier is a medium power amp design constructed in a connectorized package. Our SSPA is designed with SMA connectors and rated at 1 Watt. Pasternack solid state power amplifier part number PE15A4008 SMA medium power amp has a 41 dB minimum gain. The medium power high gain amp is rated for a gain flatness of 1.5 dB with a Psat of 31 dBm. Our radio frequency medium power solid state amplifier is constructed for minimum frequency of 8 GHz and a maximum frequency of 12 GHz. Additional radio frequency specs on this high frequency high gain medium power solid state power amplifier from Pasternack can be found in the details on the RF power amplifier datasheet specifications PDF above. 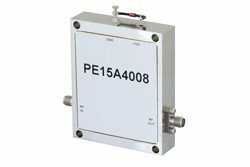 Our medium power high gain HF amplifier is part of over one 40,000 RF, microwave and millimeter wave components in-stock. 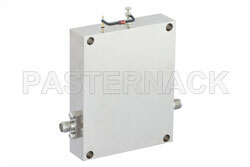 This medium power 1 Watt radio frequency amplifier is ready for same day purchase and shipping worldwide. Pasternack also stocks a wide range of other radio signal SSPAs that ship same-day from our facility for all your RF, microwave and millimeter wave amplifier component needs.